The tradition of planting saplings in memory of someone is an age-old practice in the country. The emotional support provided by saplings planted in the memory of loved ones is even bigger. Union minister Anant Kumar along with Vithal Yalgi, the lone freedom fighter surviving from the Yalgi’s planted trees in the name of all the 13 members of Yalgi family who were in imprisonment during freedom struggle. 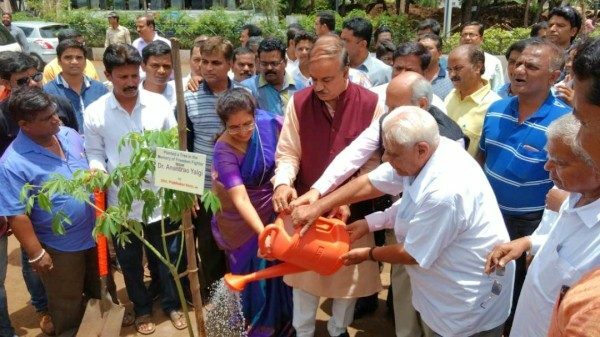 The Plantation drive will be continued in the name of all freedom fighters from Belagavi and the drive has been commenced by Former MLA Abhay Patil in the presence of Anant Kumar and Dr.Prabhakar Kore under Swachh Belgaum sundar Belagavi program. Today the plantation drive in the names of the freedom fighters was inaugurated as Yalgi family. All the trees have been planted near Maratha Mandir on Khanapur Road. YALGI , The Great patriotic family of Belgaum. Fortunate to be associated with Shri Vitthalraoji .